AllYouBet is an online sportsbook known for giving good odds on American sports, but it also has an online casino with games from Realtime Gaming. 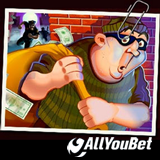 Last week RTG launched a new cops and robbers slot, Cash Bandits, and AllYouBet was one of the first online casinos to get it. AllYouBet is giving casino bonuses up to $350 and including 50 free spins on the new Cash Bandits slot from RTG. Cash Bandits is a 25 payline online slot game with two internal jackpots. It’s available in both the online casino and in AllYouBet’s mobile casino for smartphones and tablets. You can really increase your wins during Cash Bandit’s bonus round. Three or more scatter symbols trigger the Vault Feature where you crack a code to break into vaults. You can win up to 90 free spins and up to 12X bet multipliers!. New game from Realtime Gaming is also in mobile casino for smartphones and tablets. Get a 200% up to $350 casino bonus PLUS 50 free spins when you enter coupon code CASHBANDITS as you deposit. (Valid until August 15, 2015 only).